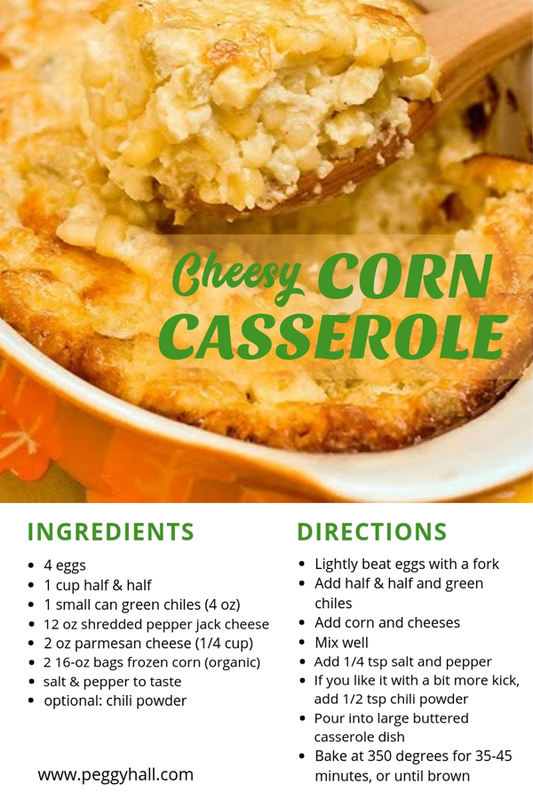 Okay, I’m giving away my secret recipe for my always-requested Cheesy Corn Casserole ~ ~ Enjoy!! With the holidays officially up on us, here are my 5 my favorite tips for "Season's Eatings" -- without indigestion! Don't swallow that bite until the food has become liquid and is mixed well with your saliva, which contains important digestive enzymes. This tip alone will prevent heartburn, gas and indigestion in the majority of people who gulp down their food before chewing. Notice the flavors, textures, temperature, aroma...and ENJOY your food! If you can't enjoy it without guilt, why eat it? This automatically slows down your eating and reminds you to swallow before taking the next bite. 4. Sweep your mouth clean before taking the next bite. You know at the end of the meal how we savor that "last bite" and sweep the tongue around the teeth? Do this after each bite and you are guaranteed to eat more slowly and digest your food better. Water dilutes the digestive enzymes and washes off the taste buds, leaving food less flavorful. Thirsty? Drink your water 10 minutes before or 30 minutes after eating. Or, wine or juice is a better choice as they contain enzymes that help with digestion. Let me know how this goes for you, okay? And I hope YOU have a wonderful Thanksgiving, shared with friends, food and family in a warm and loving festive manner that fills your heart. Please know that I appreciate YOU! How about doing down dog without any pain in your wrists or shoulders? It is possible when you understand and engage the correct muscles! A better understanding of your body and how it works. How about the name of that tendon that runs outside your ankle, you know -- that area that gets sore when you twist your ankle? Or the difference between your traps and your rhomboids, and why you should even care? ...and why it matters to you? One of my favorite past-times is is studying anatomy, biology, biomechanics of the body! That knowledge enriches my own yoga practice so much, because I have a better understanding of what's going on in my body (and why) when I'm doing certain poses. 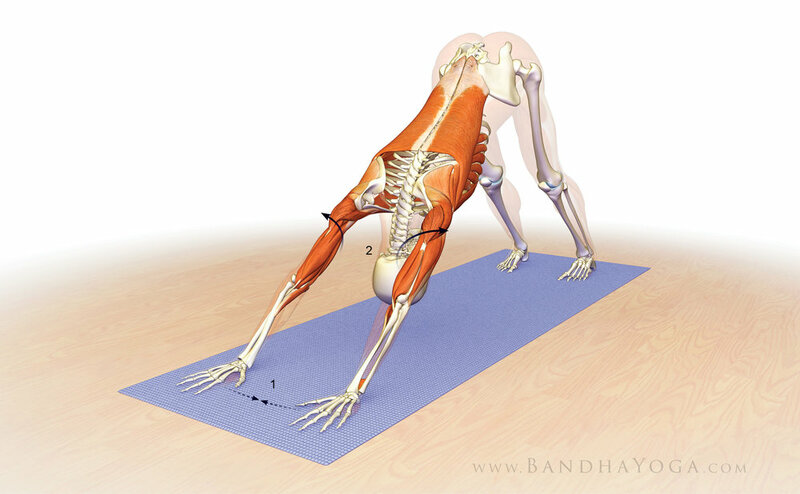 This website is basically an amazing library of knowledge on yoga anatomy. Along with amazing, clear illustrations and video. Take a look and see is you're not as fascinated by these teachings as I am. So grateful to have these conversations with you. I have not worried about these things for a long time. Worrying about what others think is too draining, too stressful, too restrictive...too much against life, growth, development and healing. Worrying about what others think can inhibit you from living freely and fully, from sharing your gifts, talents, opinions and preferences. Most of all, worrying about what others think can prevent you from living a life of joy and peace. There is one simple reason (among many) why this worry should not dominate your life -- and I'll share that in a moment. So much of my own life philosophy mirrors that of Louise Hay, sometimes I feel like I could have written passages of that book! On the other hand, the principles I learned in Boundaries were so different from how I had been living my life for 40+ years as a people pleaser, so eye-opening, and so liberating. You see, measuring and judging my every action, comment, decision, opinion, desire and preference against what "others" might think is far too stressful. More than just the stress is the sad fact that living my life in an attempt to get approval, validation and acceptance of others robbed me from living a life that was aligned with my own soul. And that is a true loss. No one really cares that much about what you look like ...they only care about what they look like! No one really cares that much about what you are wearing ...they only care about what they are wearing! No one really cares that much about whether you're witty, intelligent or successful...they only care if they are witty, intelligent or successful. In other words, people are usually more concerned with their own lives, challenges, hopes and dreams than they are with yours. and that's exactly how it should be! Read Boundaries and Heal Your Life and you'll see why. What books have made a difference in your living a life of joy and peace?